How to win against Deliveroo! 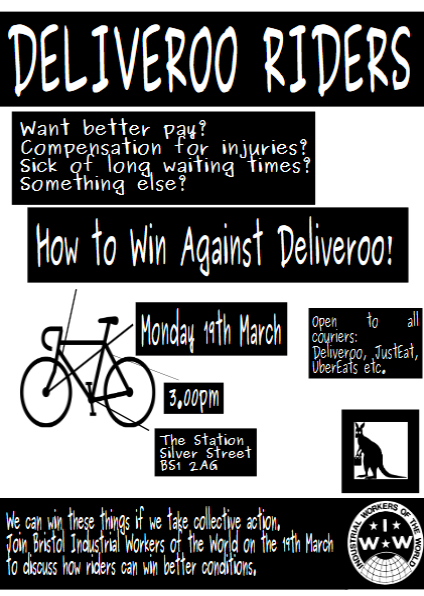 Join the IWW on Monday 19th March at The Station, Silver Street, Bristol and learn how we can win against Deliveroo and get better conditions! Deliveroo is rich and are richer from our deliveries! Since launching in 2012 Deliveroo has been notorious for dodging workers rights and exploiting riders. Despite making almost £130 million last year. Deliveroo is now worth £1.5 billion. Deliveroo claims they do not make a large profit however this is only because they reinvest most of what they make into expansion or securing debt for expansion (also CEOs like to have pay rises – Will Shu are happy to increase their pay packets by 22.5%). Work as Deliveroo courier – unstable pay and no workers rights! Couriers depend on pay which varies anywhere between £0-£12 an hour – maybe there are no orders, the restaurant and customer are far away, or you have to wait a long time at the restaurant. Riders are paying the bills for repairs and replacements just so they can work, and if you get injured you are on your own (unless you pay into schemes that in any other work you would have as a right). Deliveroo claims it’s either this way or no flexibility, but these two things are not mutually exclusive. We can still have flexibility, minimum pay above £0, and the workers rights so many other workers are guaranteed. Deliveroo are not the only ones. Similar delivery companies like JustEat and UberEats continue to avoid treating riders properly. We, the riders who make the money for these companies day-in day-out, deserve respect! What do you want to change? What do you want to change about your work as a courier? Do you want better pay? bike repairs covered? a guaranteed minimum wage? free compensation for injury? or something else? Many of us want similar things.